An easily absorbed, intensely nourishing treatment for dry, chapped hands, that leaves your hands soft and smooth. 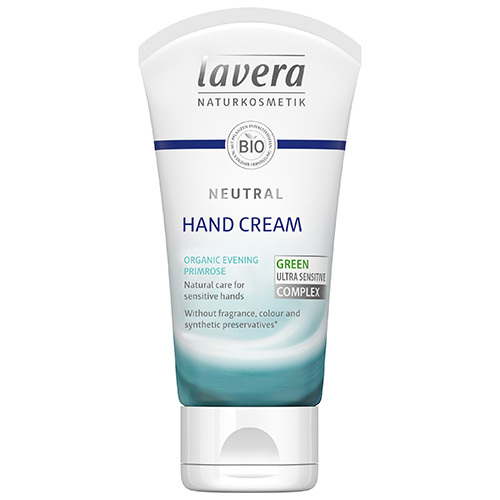 Natural care for sensitive hands. 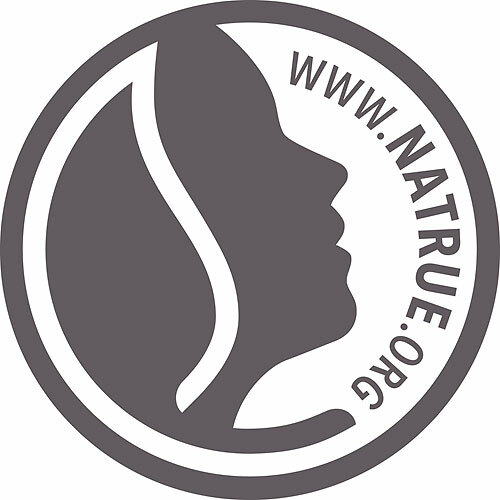 Neutral products offer natural organic protection and care for people with allergy, eczema and extremly sensitive skin. All the formulas are free from flower and herbal extracts and essential oils. Especially gentle care for a soothing sensation - The Neutral system is wonderfully soothing, protective and pampering to particularly sensitive skin. Developed on the basis of the founder of lavera’s personal experience, the system also incorporates the latest dermatological findings. Truly beneficial for sensitive skin. Contains: 50ml of hand cream. Water (Aqua), Butyrospermum Parkii (Shea) Butter*, Olea Europaea (Olive) Fruit Oil*, Glycerin, Alcohol* Denat., Glyceryl Stearate Citrate, Rhus Verniciflua Peel Wax, Myristyl Alcohol, Cetyl Alcohol, Oenothera Biennis (Evening Primrose) Oil*, Glycine Soja (Soybean) Oil*, Foeniculum Vulgare (Fennel) Fruit Extract*, Hamamelis Virginiana (Witch Hazel) Leaf Extract*, Dipotassium Glycyrrhizate, Xanthan Gum, Sea Salt (Maris Sal), Tocopherol, Helianthus Annuus (Sunflower) Seed Oil*, Ascorbyl Palmitate, Hydrogenated Palm Glycerides, Hydrogenated Lecithin, Brassica Campestris (Rapeseed) Sterols. ** Ingredients From Certified Organic Agriculture. 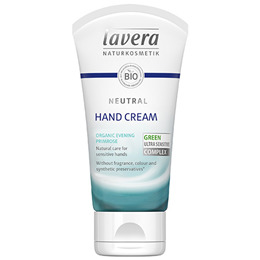 Below are reviews of lavera Neutral Hand Cream - 50ml by bodykind customers. If you have tried this product we'd love to hear what you think so please leave a review.